Now lets understand the business Aries Agro operates in simple words. Above are the verticals the company categorizes its product. As you can see mostly the products are for Crop Nutrition (to increase productivity and protect them from various disease). Micro Nutrients, Plant Protection, Specialty Nutrients and Water soluble NPK are all in one way and other cater the business need of Crop Nutrition and protection. It is also expanding its foot print into Crop fertilizer space as well. Along with Crop protection area it is now slowly developing products to cater Animal nutrition. Mainly as of now Fish is the target animal as it has multiple products for Fish. For Cow it has one product and growing with time. Now we will look at the performance of Aries agro stock from IPO days. That would give us idea about how well Company has grown over the years. Everything we mentioned in overview is that reflecting in prices or not. The company made debut on Exchanges in year 2008 at slightly above 200 mark. The time was not good due to 2008 global crisis and stock fell below 50 mark. The prices climbed again in year 2010 just below 200 mark. If you see above graph you can see up and down then again up and down. Till year 2018 the stock was not able to touch the IPO price. Now only in this year it touched the mark but again prices reached around 100 mark. The IPO investors have not made money in this counter. Only thing positive is dividend yield which at current price is at 2%. But any investor who have invested at low price point and timed their exit have only made money. If you are into long term investment then it is difficult counter to make money. Aries Agro is in portfolio of leading investor Vijay Kedia. Looking at above price performance I am not convinced in the stock. A good investment grade is slow rising stock with positive return on most years of operations. It is most of a trading type stock as per past performance. You should really have to time your entry and exit in this stock. I personally do not like this zig zag movement in investment grade stocks. There are many players in this segment. 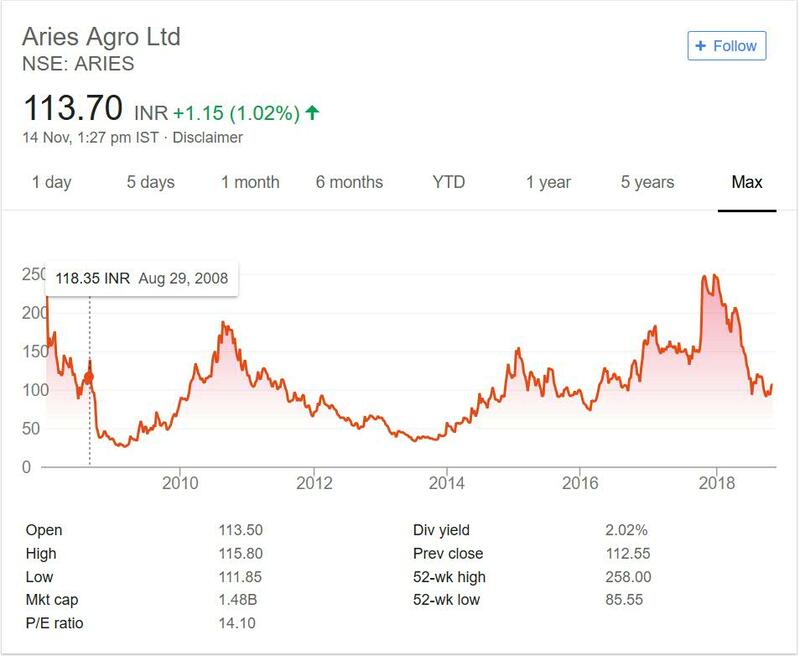 If you are really interested in Crop protection segment or sector then you can list those stock and compare them with Aries Agro. I will write article on comparing stocks in the segment in future. For now I will not recommend or track this stock based on its past performance. As mentioned above I would not recommend this stock. So I will not write further article on in depth analysis or track it for now. In case you are interested then you can track the same and get more details about the company.